ALLARD -Nieu Amsterdam al. New York. ALLARD, C. - Nieu Amsterdam al. New York. Nieu Amsterdam al. New York. - ALLARD, C.
Title : Nieu Amsterdam al. New York.. Size : 8.3 x 10.6 inches. / 21.2 x 27.0 cm. Description :Engraved by Aldert Meyer for Carolus Allard's for his Orbis habitabilis oppida et vestitus the print shows two locals and a distance view of lower Manhattan. This rare work was published in 1710, which portrayed the styles of clothing of various people around the world and some of their towns and cities. First state, later re-published by Pieter van der AA. "Orbis habitabilis" is a rare and interesting book illustrating towns and costumes. 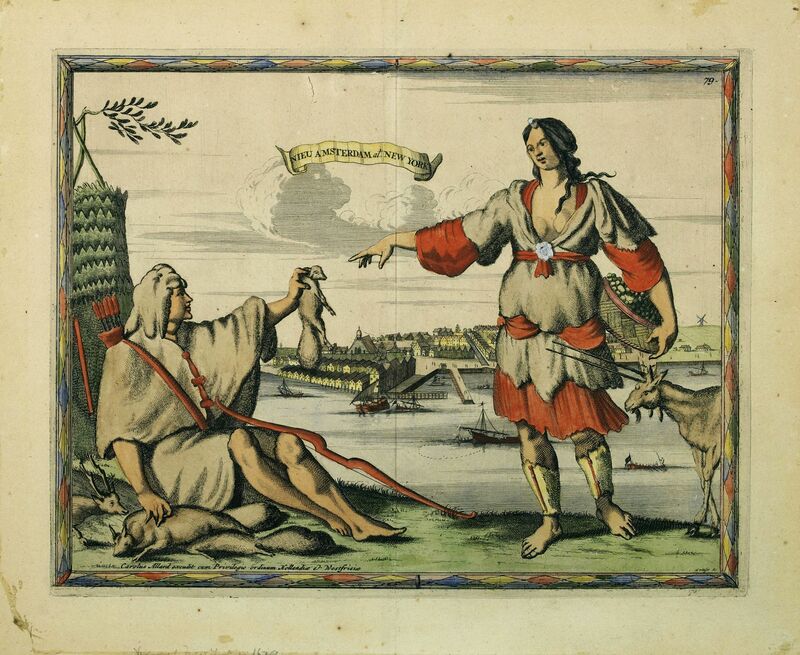 In many cases a plate of a town is followed by another showing the costume of the inhabitants , as is shown in this view of Paris. The images are excellent in design and execution, and wide-ranging and comprehensive in subject matter. Carel Allard is considered to be the first compiler of a townbook to couple the plates this way. Orbis habitabilis comprises 28 views of European towns (including four costumes), 24 Asian towns (including 4 costumes), 24 African towns (including 6 costumes) and 24 American towns (including 8 costumes). The text for the book is in Latin by Ludolph Smids, a Groningen doctor and antiquary who settled in Amsterdam in 1685. Provenance : "Goelet Family, until 1917. On verso "Consignor Goelet." - The Goelets own privately Gardiner's Island at the end of Long Island. It is the only American real estate still intact as part of an original royal grant from the English Crown.). Mr and Mrs Noel Bleeker Fox, New York, since 1917. Cooper family, NY since 1976. Now, NY private collection. Condition : A good and dark impression. Some very light discolouration of paper. Mounted on card board. Some outer marginal browning due to old framing.